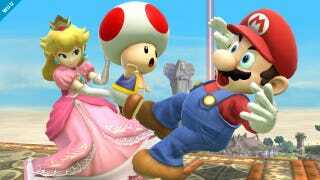 Nintendo released a new batch of screenshots for next year's Super Smash Bros., featuring Mario's damsel in distress, Peach—except here, she's the one opening a can of whoopass on everyone. Including Mario, of course. And she did all that wearing heels. Impressive!